-Tickets are distributed to give migrants an appointment to sleep in the center. Meanwhile the migrants are sleeping rough outside the center, with a town hall that knowingly closes their eyes to the appalling sanitary conditions. – of the migrants with whom we have talked who have actually passed through the official centre, many have had no information on the asylum procedure. Inside, they just tell them that once they are transferred to centers around France they will have all the necessary information. We had to give them the address of our offices, and so once again do the work of the state and the City, just a few meters from a center run by them. – there was poor organisation (no organization at all?) In the legal management of the center: migrants are not told much about the asylum procedure; Worse, they play on migrants lack of legal knowledge and there is pressure on migrants to give their fingerprints if they want to sleep warm. – We encountered migrants who have “Dublin” fingerprints in other countries sleeping in the surrounding areas, who were afraid to return to the center, having heard rumours of the others that have been transferred out of France. -a lot of translators inside but not in the good dialect of Arabic. For example a lot of Algerian or Moroccan dialect that the Sudanese told us they have difficulty to understand. They find themselves signing papers they do not know the meaning of. 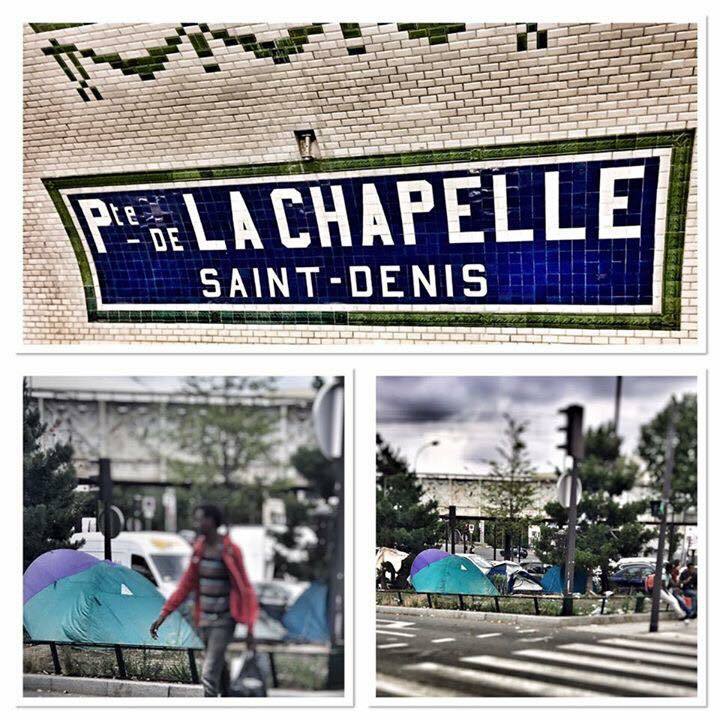 – people transferred from the center to CAOs who have then returned have no right to re-enter the center of La Chapelle and therefore stay in tents (if they are lucky enough to have them). – for the unaccompanied minors, a first facial evaluation takes place in the center, by La Croix rouge. Those who are recognized as minors by the Red Cross, with the facies therefore, are then oriented to the DEMIE (evaluation device of isolated foreign minors). – for food, the only thing set up by the Town Hall is the evening distribution with the association La Chorba. – We have seen the presence of several women, also sleeping in tents, not having been sheltered. -600 people in total sleep on the outskirts of this center. There are only 3 toilets, 7 urinals and a single water point for 600 migrants. – Many people sleep on cartons, without sleeping bags, in unacceptable sanitary conditions. – finally, it seemed important to highlight the presence of 3 policemen taking their tea inside the center. Policemen who gassed and mangled the migrants several times, can return to this center while some migrants can not even access it. It is important for us to refute the communication of the City of Paris and the prefecture on this center, which is presented as a success and a pilot center. Around and in this center, it interferes with the right of asylum, the right of protection, the rights of man.